The BCD-1000 is a powerful customer display from Bixolon that has no equal. Many functions are already included in the standard version which adds to numerous advantages like high reliability and modern design. 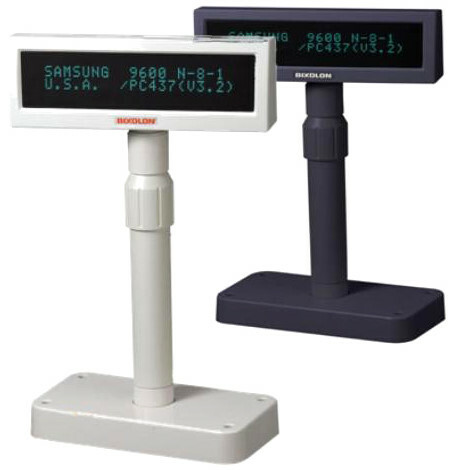 The customer display is available in white or black with either a serial or a USB interface. One of its extraordinary features is the variable power supply of 5-24 volts. You connect this vacuum fluorescent display in various ways: simply take an inexpensive AC adaptor of your choice that lies in the range of 5V to 24V. Alternatively, the BCD-1000­ can be power­ed directly from the cash register or printer using a passthrough connector. This saves extra AC adaptors and helps to avoid cable problems at your POS station. The display can be freely adjusted which puts its elegant design right in front of the customer. Its variable stand with a maximum height of 374mm fits into any POS environment, just like the pivoted display head with its 2x20 high-contrast characters in blue/green. 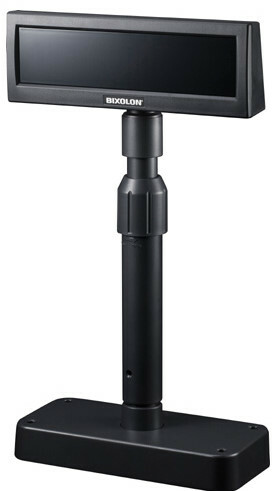 For harsh conditions, such as very narrow checkout areas, the stand can be easily mounted to the desk and height-adjusted according to your different needs. Because of its high reliability and an MTBF value of more than 20,000 hours, it is truly a long-term investment in professional hardware that pays off. ECR/POS communication ensures flawless integration into any POS system and, as this protocol is standard for POS terminals, software support is always guaranteed. Numerous codepages included in the standard allow application in most countries. Click the button below to add the Samsung Bixolon BCD-1000 Customer Pole Display BCD1000 to your wish list.